I’ve shared my mom’s families tradition of doing Family Gifts each Christmas. Two years ago I did a “Pop” Themed Gift Basket. I’ve also done a Charlie and the Chocolate Factory theme, a Hillbilly Theme, Pirates of the Carribean Theme, and tons more. This year I couldn’t decide so ended up going with “Our Favorite Things” theme. Each person in my family picked one of their very favorite things and we put the hod podge into gift form! Four super hero movies. My entire family is into these movies, so this one represented us all. Stuffed elephant. My youngest loves elephants. Always has, so this was a given. Sour Patch Kids. My son chose this, but really it is another family fav. Washi Tape. That was my pick and my kids agree that it is something we all like to play with. Monopoly Deal. We play this game while camping a ton. It’s definitely a fav. Vera Bradley Change Purse Key Wallet. I keep my wallet on my key ring so I don’t always have to carry a purse, so this was one of my picks. Jar of Hershey Kisses. Who doesn’t love Hershey Kisses? Another family fav. Jar of Pink Peppermints. This has been a family favorite passed down for generations, starting with my grandmother. She always kept pink and white peppermints in her house. My mom does that same thing and my children love them as much as I did as a child (still do!). Amazon Gift Card. Amazon is one of my husband and mine’s favorite place to shop. We have a Prime account and use it often. Fudge and Glass Etched Glass Dish. I’m going to make some fudge and will put it in the glass that I etched. It combines a fav dessert with one of my all time favorite activities: crafting! I ended up putting everything in a gift bag and needed a tag to illustrate what the mixture of items meant so I designed a “A few our of Favorite Things” gift tag, which I am sharing with all of you, in several color schemes. 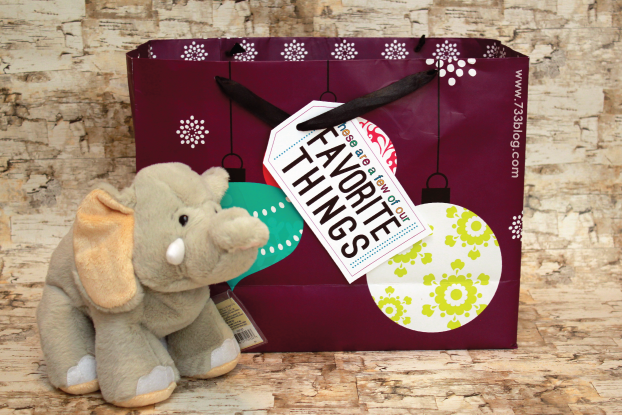 Download the “Favorite Things” Gift Tag via Google Drive. 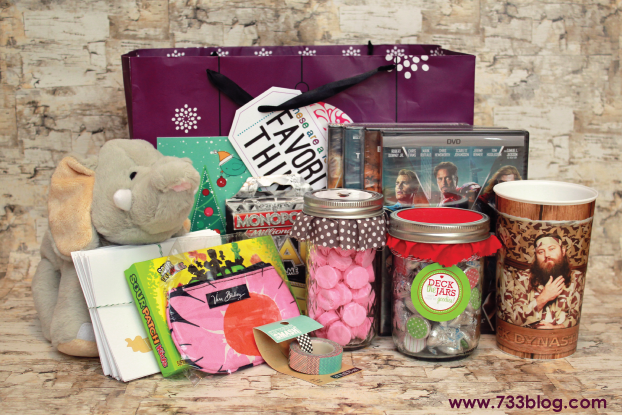 What are some gift basket themes that you have done?